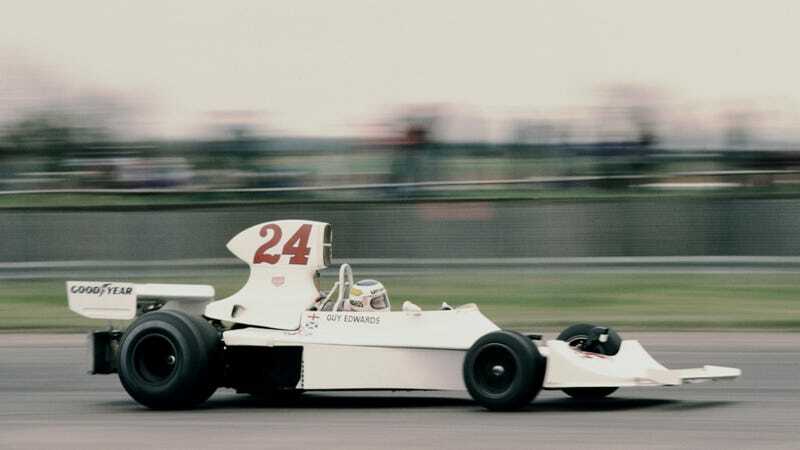 Guy Edwards practicing for the Graham Hill International Trophy at Silverstone Circuit in 1976. Recent reports claim driver Guy Edwards, who ran 11 Formula One races over three years in the 1970s, has died at age 75. Corrections to those reports came out Tuesday morning, with Motorsport.com’s saying a “former colleague of Guy’s was able to track him down ... and confirm that he is very much still with us.” Oops. One obituary that hasn’t been taken down—a bad practice even if reporting is false, because transparency in corrections is better than deleting stuff outright—said Edwards “had been ill for some time,” and that he died “exactly five years after his son Sean was killed in an accident at Queensland Raceway.” That report, via Eurosport, also mentioned Edwards got a Queen’s Gallantry Medal for helping save Niki Lauda in his fiery, near-fatal Nürburgring F1 crash in 1976. That last part is true, but the reports of his death weren’t. Motorsport.com and its sister site Autosport, which are part of the Motorsport Network, were among news sites that posted obituaries for Edwards after his reported death. Their separate correction posts say “multiple sources reported that Edwards had died” when they posted the obituaries, but it isn’t possible to see which sources, since their obituary links now lead to 404 error pages. Multiple sources reported that Edwards had died, but after posting our tribute to him this morning, a former colleague of Guy’s was able to track him down to his cottage in Ireland, speak to him personally, and confirm that he is very much still with us. We thus apologise to Guy, his family and many friends in the business for repeating the erroneous story, and we hope that he remains safe and well for many years to come. Other outlets covered the false death reports as well, and Eurosport’s story quoted above and headlined “Ex-F1 racer Guy Edwards dies aged 75” is still up without any corrections as of 12:45 p.m. ET on Tuesday. There aren’t any excuses for messing up the facts, but mistakes happen at any job from time to time—the important thing in journalism is to be transparent about those mistakes, which 404 errors on formerly published obituaries like the ones published by Motorsport.com and Autosport aren’t the best example of. A large correction note followed by the original story probably would have been best in those cases. Regardless, former F1 driver and person brave enough to pull somebody else from a burning F1 car Guy Edwards is alive, which he is probably relieved to hear.